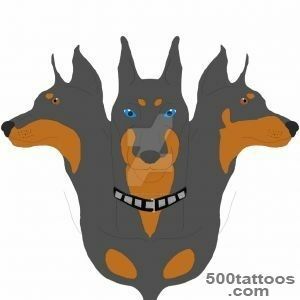 In a previous article , we examined in detail the tattoos depicting dogs . 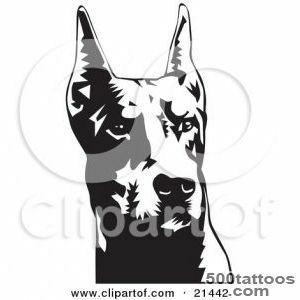 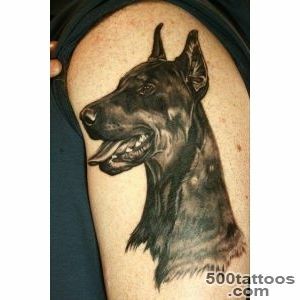 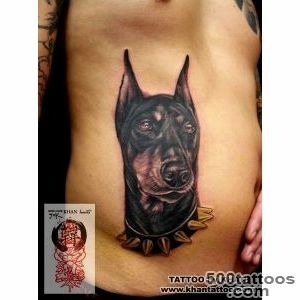 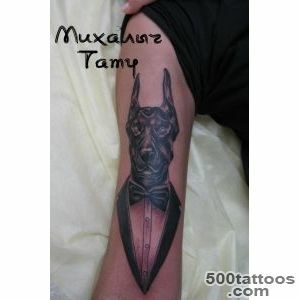 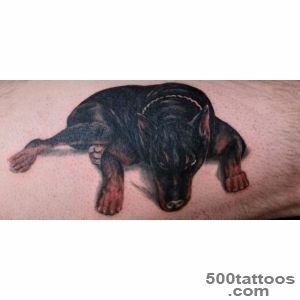 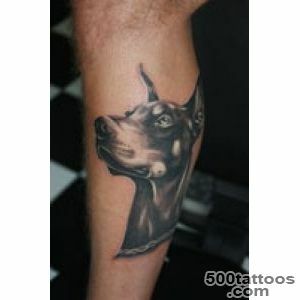 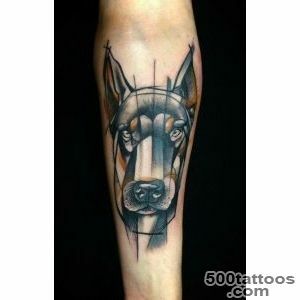 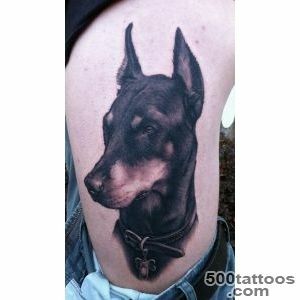 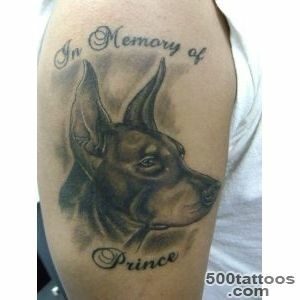 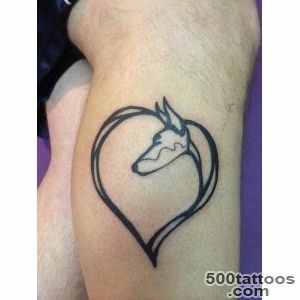 Today let's talk about the particular case - a tattoo with the image of a Doberman . 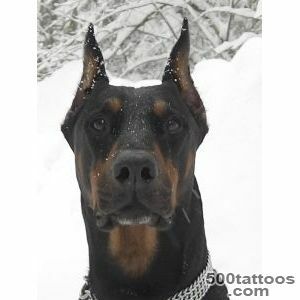 He is considered a strong , aggressive, but at the same time faithful and devoted friend . 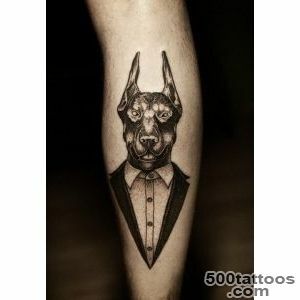 For his master's such a dog is a helper and support. 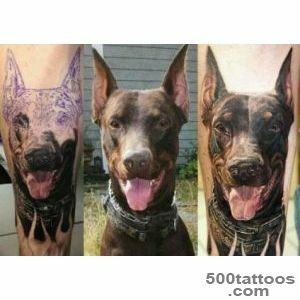 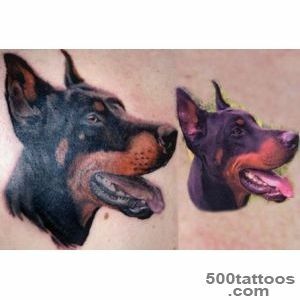 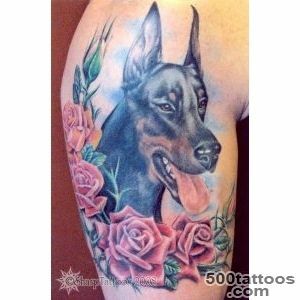 As is the case with other pets ,Doberman tattoo can be done directly in the sign of love for your pet , including , departed from life. 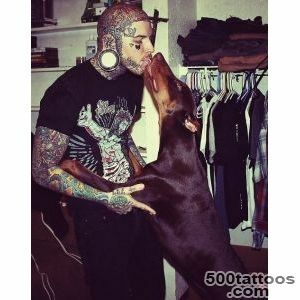 The relationship between man and dog is incredibly powerful . 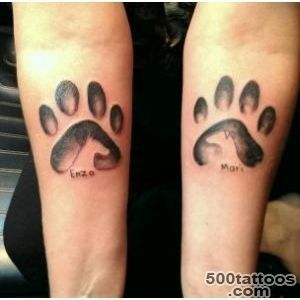 This is truly committed to each other friends, relationships which are sincere and disinterested . 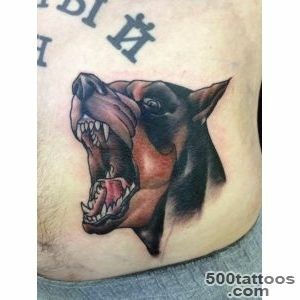 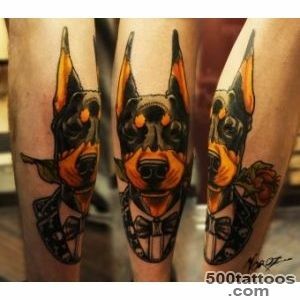 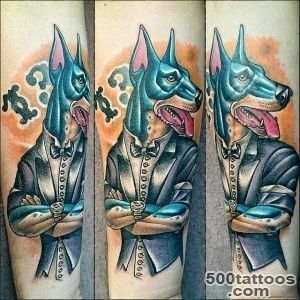 Speaking of tradition and cultural characteristics of different countries,You can talk about the mystical meaning of the tattoo Doberman . 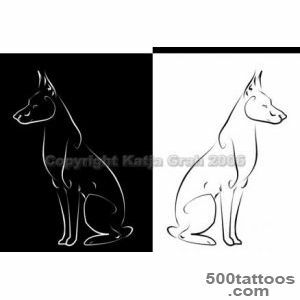 It is believed that the image of black dog - a sign of people with psychic abilities . 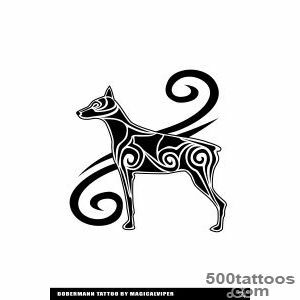 Magee , wizard , witches , shamans and psychics believe in the esoteric properties of the symbol . 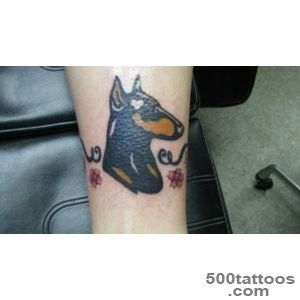 Should we keep this in mind before going to the tattoo parlor ? 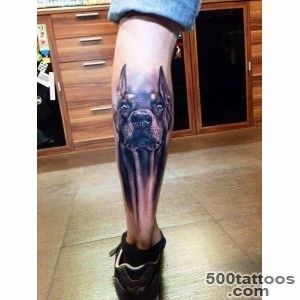 I think no. 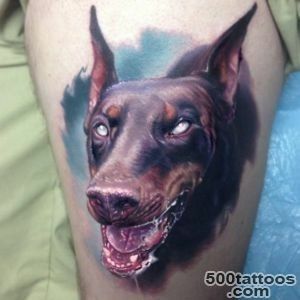 HOW TO VIEWMost private images warrant any dog ​​- a grin , that is kind of grinning muzzle . 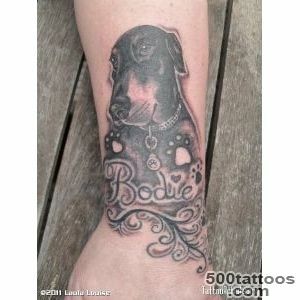 This case - is no exception . 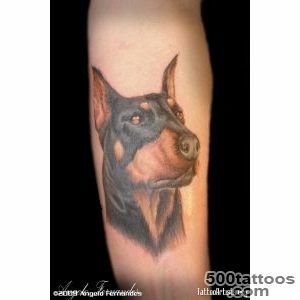 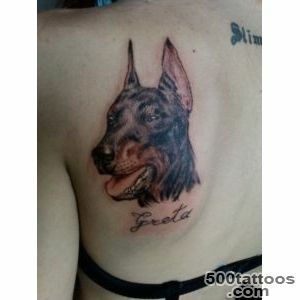 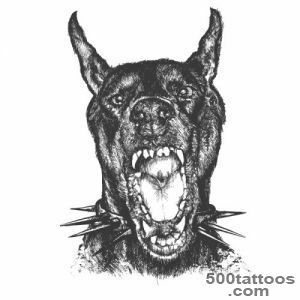 Tattoo grin Doberman , as well as in the case of the pit bull , evokes fear, feelings of insecurity and anxiety . 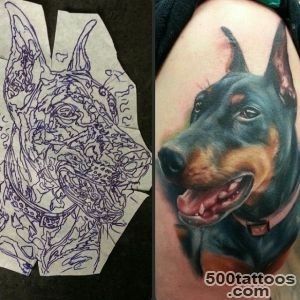 Often, the owner of a tattoo becomes more self-confidence , a kind of strength and courage. 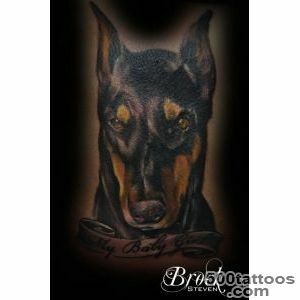 In addition to grin ,photos in our gallery you will see a picture of a Doberman head with calm and cool features . 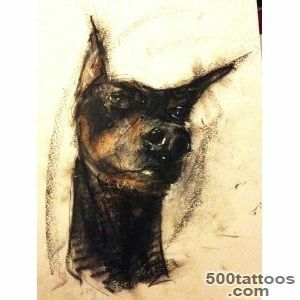 This type of image radiates wisdom , serenity , inner strength . 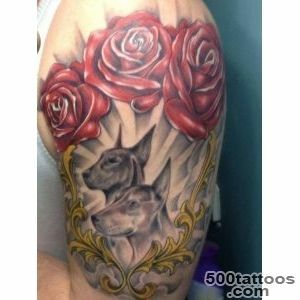 It is important to mention that having a tattoo on any additional elements can give a different meaning and significance . 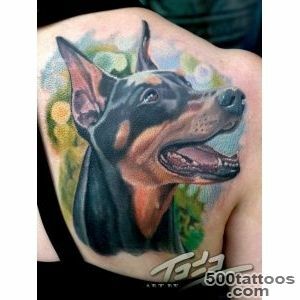 For example, girls can add to the picture Doberman flowers,butterflies or birds . 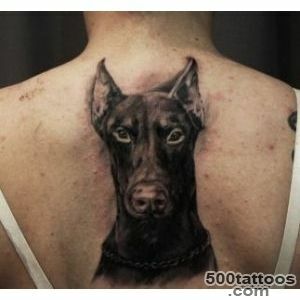 Naturally, this will soften the harsh appearance of the animal. 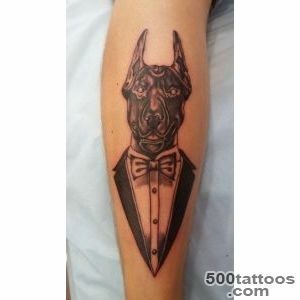 As for colors , Doberman - black dog , and his portrayal of the human skin , usually prevails dark color palette . 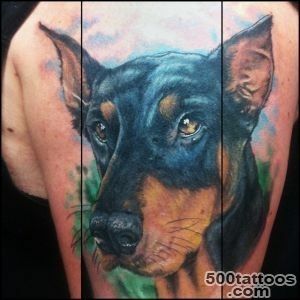 However , the presence of contrasting bright colors of red or green can be an interesting way to change the picture. 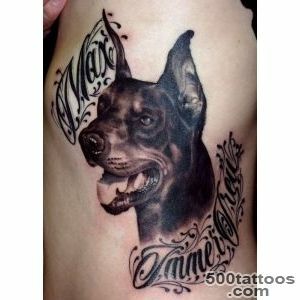 WHERE stuff ?Traditionally Doberman tattoo placed on their sides , chest or shoulder . 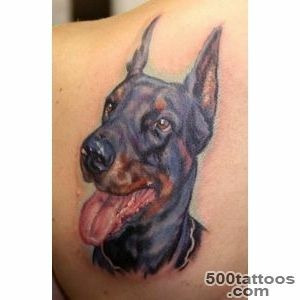 Such a plot is suitable rounded part of the body . 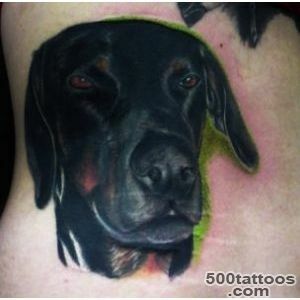 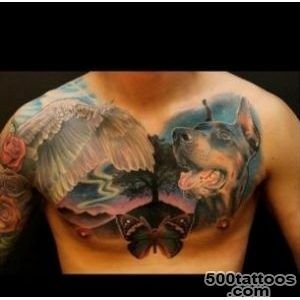 This is not a panacea , you can come up with a variety of options of how to arrange the picture of a dog on his body . 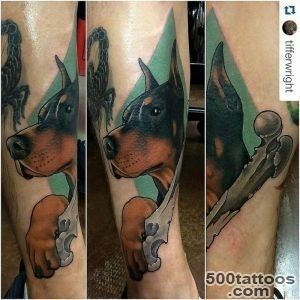 Taking a picture of a miniature , it can be placed behind the ear , on the ankle or wrist .It all depends on your imagination and skill of the artist .